The Circle of Life in the food and beverage industry continues to spin. The past couple of months have seen some iconic companies come but mostly go. The December issue of Food Processing has a little of both. The most recent departure, although one that's not a fait accompli just yet, is ConAgra's acquisition of private label powerhouse Ralcorp. Regrettably, I never visited the only-18-year-old acquired company, but I did visit St. Louis years ago to meet executives at Ralston Purina. Ralcorp itself is a microcosm of this Circle of Life stuff, having begun as a feed mill company (Purina Mills) that developed a breakfast cereal (named after a Dr. Ralston) right around 1900. Chex cereals, which I assume were named after the checkerboard logo of parent Ralston Purina, were sold to General Mills while the pet food company went to Nestle. Livestock feed company Purina Mills is now part of Land O'Lakes. And what was left became Ralcorp. An interesting milestone along the way -- which I forgot but for which I must give credit to Wikipedia – is that an acquisitive Ralston Purina once acquired Continental Baking Co., which itself through a series of acquisitions can lay claim to Twinkies and Wonder Bread. Which brings me to Hostess Brands. In print and moreso on our web site, we've chronicled the trials and tribulations of this collection of regional bakers and national brands. Last time I looked, the company still was in the process of liquidating – although its status changed on a nearly daily basis in mid-November. Despite some last-minute efforts with its unions, it looks like Hostess will go the way of Continental Baking. So I worry about Twinkies, Ho Ho's, Sno Balls and Donettes finding a new home. But moreso I worry about the 18,000 employees facing unemployment at Christmas time. Whether the villains in this story are their power-hungry union bosses or overcompensated and uncommitted company executives, the rank and file employees are the ones who will feel the loss the most. I assume the Hostess outlet store near me will close soon. The Sara Lee store already has. I worry about Kraft, too. It seems like every story we ran around the October 1 split of that big company talked about the "high-growth, high-potential, high-margin" snack food brands going into the new global firm Mondelez International – even the Kraft chairman and CEO, Irene Rosenfeld, jumped onto that ship. Meanwhile the well-known but stodgy North American grocery brands stayed with the new Kraft Foods Group, described by analysts as low-margin, slow-growth. Even calling it a "Group" instead of Inc., Corp. or Co., sounds like a red flag to me. Enough hand-wringing. The other side of that Circle of Life is on our cover and on pages 22-40. 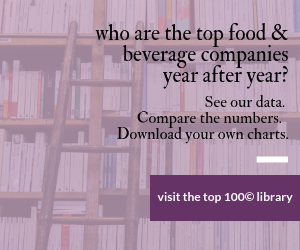 For every company leaving the food & beverage industry (and our Top 100© companies list), there are new ones just getting started. As our cover states, Chobani has grown from zero to $1 billion in just five years. There are a couple of great stories within the overall Chobani story: Turkish immigrant becomes millionaire; dilapidated cast-off plant launches a billion-dollar company; startup goes toe-to-toe with the likes of Dannon and General Mills; a product many consider better than our candified American yogurt catches on; no product development team, but rather an Innovation Team. To that last point: "We don't really test products in a traditional sense. We simply ask ourselves, "Would we want that in our own refrigerator?' " says the vice president of new ventures and innovations. So we dedicate this issue of Food Processing, this year's Processor of the Year story, to the underdogs, the up-and-coming companies, the visionaries with a new and better idea. Good luck to those of you who fall into that category.